Product prices and availability are accurate as of 2019-04-05 18:30:51 EDT and are subject to change. Any price and availability information displayed on http://www.amazon.com/ at the time of purchase will apply to the purchase of this product. - These Wash cloths are made from 100% Bamboo Fiber. Bamboo is a highly versatile natural resource, Bamboo is quite simply Mother Natures Choice! - Bamboo is 100% Biodegradable and naturally hypoallergenic which gives Our conscientious consumers real peace of mind. Our Washcloths are Naturally Hypoallergenic and Great for Sensitive Skin. They are More Absorbent and softer than traditional cloths. They come in a large set of 8, and are a generous 10" X 10" in size. The Set consists of 4 colors: light green, natural light yellow, natural off white, and Chinese Lucky lavendar. They are Great for Baby Bath time make a Handy addition to your Diaper Bag, and Great for Adults too. Take them everywhere with you you wont want to be without Them! 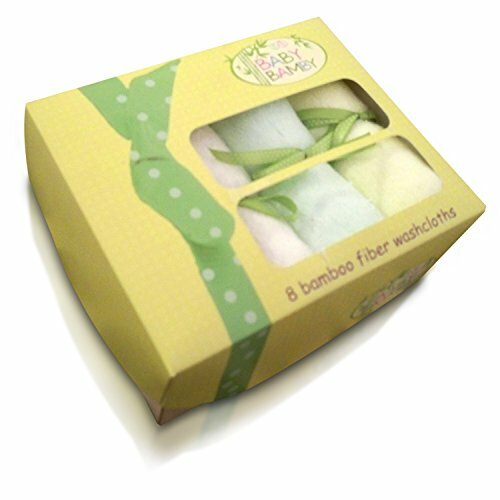 100% SATISFACTION GUARANTEED - As Family Business we fully Guarantee the quality of our Bamboo Baby Washcloths. If you are not completely satisfied with them, we will replace the set or give you a full refund, whatever it takes, no questions asked. Your satisfaction is truly our number one priority. Make a difference to our Childrens future environment and ensure their roots are just as prolific as Majestic Bamboo!! Click on the ADD TO CART Button now and Help Preserve Our world, Choose Bamboo!! 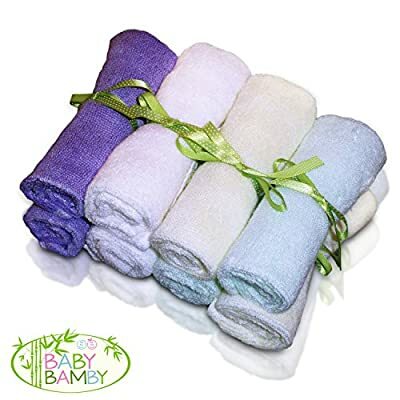 BABY BAMBY**THE ORIGINAL** BAMBOO WASHCLOTH - We offer our customers 100% Authentic Premium Bamboo Fiber towels, Being a Natural Product of the Highest Quality, we can deliver premium softness for all types of senitive skin and are fantastic for facial, body & hand eczema. As a company commitment and unlike many other companies we do not shrink wrap/poly bag our washcloths for environmental reasons, therfore our Wash cloths are truly MOTHER NATURES CHOICE! PERFECT BABY SHOWER GIFTS - Our Washcloths are unique and make great Baby Gifts, Parents and Newborns will adore them, they come in a set of 4 colors: light green, natural light yellow, natural off white, and lucky lavendar, their unisex appeal means they are suited to infants and toddlers both boys & girls, and as an added Bonus they come in 3 different color presentation gift boxes for you to choose from!! A GREAT VALUE OFFER SET OF 8 - Our Bigger pack size means you get more for your money!! They also make great travel wipes (each towel measures a Very Generous 10"x10") take them in your diaper bag everywhere and use them for meal times, bathing and trips on the go, your newborn will always be comfortable,clean & fresh thse luxury washcloths cause no irritation as Bamboo has natural Hypoallergenic properties! 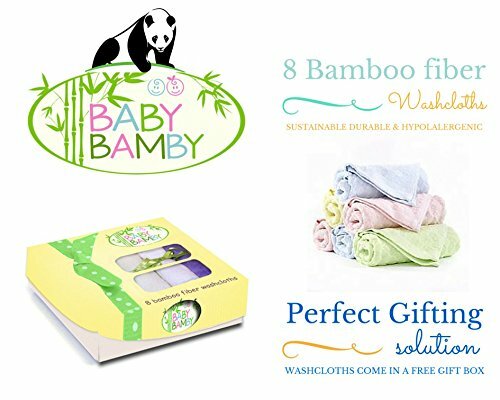 100% SATISFACTION GUARANTEED -As a Family Business we fully stand behind the quality of our Bamboo Washcloths. If for any reason you're not completely satisfied with our product, we will replace the set or give you a full refund, whatever it takes, no questions asked. Your satisfaction is truly our number one priority. Remember when you buy a set of these Eco wash cloths you are doing your bit for planet Earth, Together We can make a difference to our Childrens future environment and ensure their roots are just as prolific as Majestic Bamboo!! SOFTER AND MORE ABSORBENT, Bambys are perfect for making bath time more enjoyable, they Really are Super Soft and better than cotton cloths making them more gentle and causing less irritation on babies sensitive skin, they harbor anti bacterial properties, are free of any synthetic fibers and are also chemical free. Babies and Adults can use them wet or dry with their favourite oils and ointments for daily skin care needs. Great durability means you can reuse them over and over again and actually get SOFTER after each wash!! !